This is technically not a knitting post so you can stop reading now if that’s what you are looking for. But I love Caribbean culture (I admit to being biased but I’m Jamaican and I think that’s allowable) and I am sure it must have some influence on my design and knitting style. 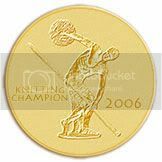 I did take “Bad Penny” with me to the parade and knit on the subway all the way there and back. 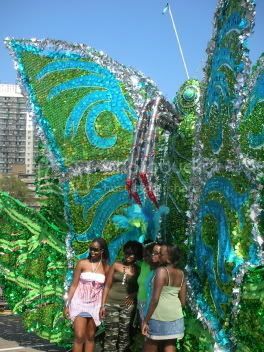 The 40 year old event known as Caribana was renamed this year because of financial and legal strife. These difficulties were generally unknown to or ignored by the one million participants who gathered in Toronto’s streets to participate in this annual event, apparently the largest street festival in North America. 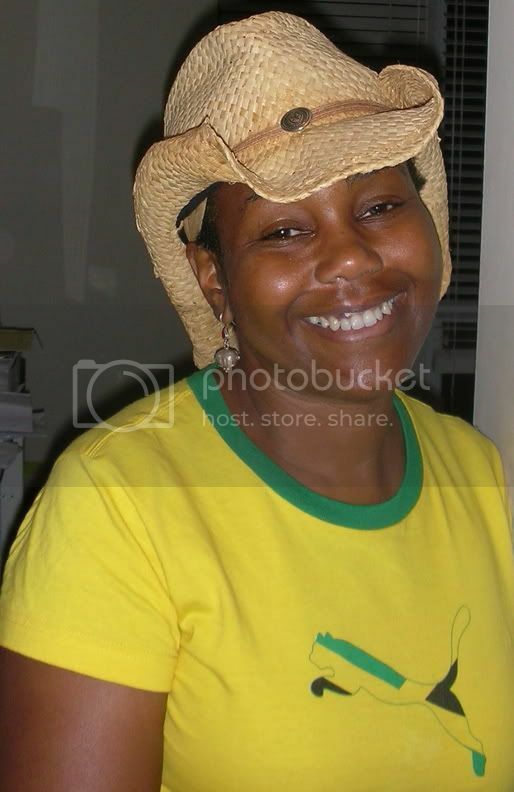 Here I am below wearing my Jamaican urban cowgirl ensemble. 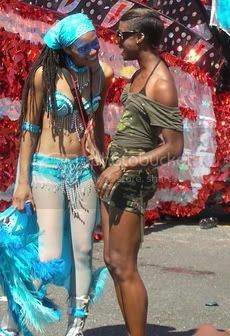 After forty years (yes I attended the first Caribana parade) I am more practical than flashy with my look. Eight hours of sun, heat and crowds is nothing to get flashy for. The first time attended I traveled like this little girl, on my dad’s shoulders. Later on as a teen-ager, when I ditched my family and went with a posse of girlfriends I would have had the 70’s equivalent of the outfit worn by these two young ladies, but no cell phone. How can they hear anything with all the noise around them. Teen-agers must truly live in the cocoon of an alternate universe where they can only hear their own voices. Below we have the typical encounter of two people who haven’t seen each other since last years parade. I used to spend half my time at parades doing this. I think that was one of the main reasons we went. I went with my sister. My daughter was supposed to come too but she partied too hard the night before and was ill. She missed a good parade, but I was able to focus on taking lots of photos without the distraction of body guard duty. The parade was schedule to start at 10:00 am at the grand stand of the Canadian National Exhibition. We started in China Town with a dim sum lunch at noon. We could have eaten at the parade but I wanted to sit down and have something different. The entire 3.5 km length of the parade was lined with food vendors of every kind of Caribbean food, including mountains of fresh coconuts. 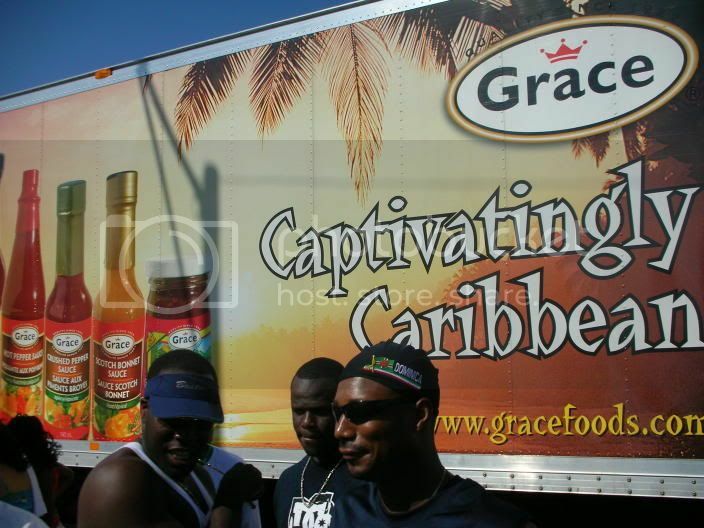 I have featured the Grace truck because this truck stopped at intervals and dispensed much needed free grapefruit pop. Thank you Grace. We arrived on Lakeshore Blvd by 2:30 pm. This is good timing for this event. The parade never starts or finishes at the designated time. You can not synchronize an event that features maximum improvisation and audience participation and photo ops. Many tourists took the opportunity to have themselves photographed with paraders. I’m sure that the truckers driving the 18 wheel flat bed trucks had the most stressful jobs of the parade ;) How could they possibly concentrate on driving through crowded streets with scenes like just outside their cabins. The gyrations known as “whining”/ “whinin’” (is there a correct spelling for this?) 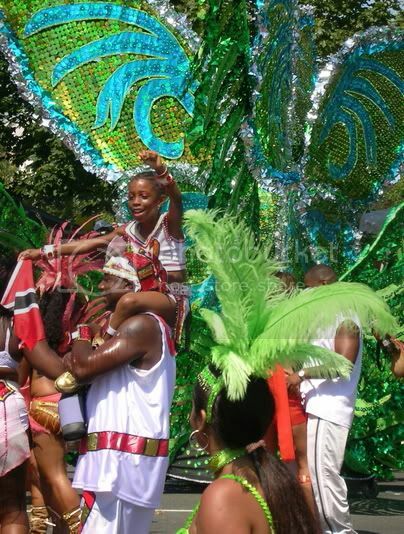 were up to the usual standard set by Trinidad and Tobago Carnival which is the example that this Toronto’s festival follows. There is even a King and Queen contest. Now I have never wanted to ride a flat bed truck while “whining my waist line” (really and truly, you have got to believe me), but I have always wanted to be Queen. More on this in my next installment. posted by Scheherazaad @ 8/17/2006 12:55:00 p.m.
honey, you don't look old enough to have kids! and finally a freakin foto from my girl sharon. you just made my day!!! now, i see where your daughter got her looks from. lucky girl! i love the foto of the girls with their 'backs' on the cop. that is topshelf, sweetheart. Every year the newspapers publish a photo of paraders "rubbin' up" on "men in uniform". In the 70s the cops actually tried to keep a straight face and act as if nothing was happening. Now they usually laugh. Poor things, I guess they can't really shake what their mama gave them while they are on the job.